Have you noticed that the instant pot has literally blown up all over the place? Everyone wants an instant pot. And there is good reason behind that. It’s a great fast cooking method that literally takes minutes from start to finish on certain meals. It also greatly reduces the cooking time on many of your other favorite dishes that would either take hours in the crockpot or oven. Overall the instant pot is seriously a great purchase and I’m so happy that we decided to get one. 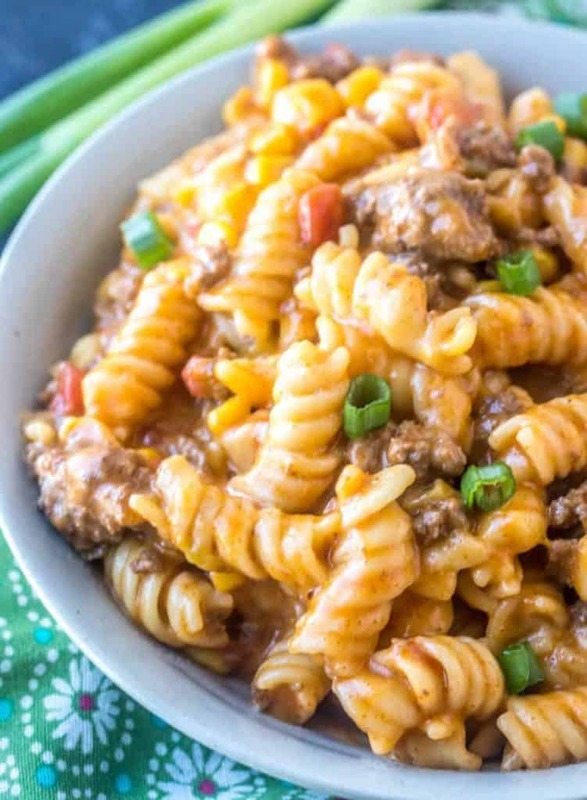 So let’s talk about this Instant Pot Taco Pasta? Seriously one of the most simple dinner recipes ever. Around my house, simple is good. With 4 kids, getting supper cooked and on the table in a timely fashion is appreciated. My kids love anything taco. I mean who doesn’t love anything taco? 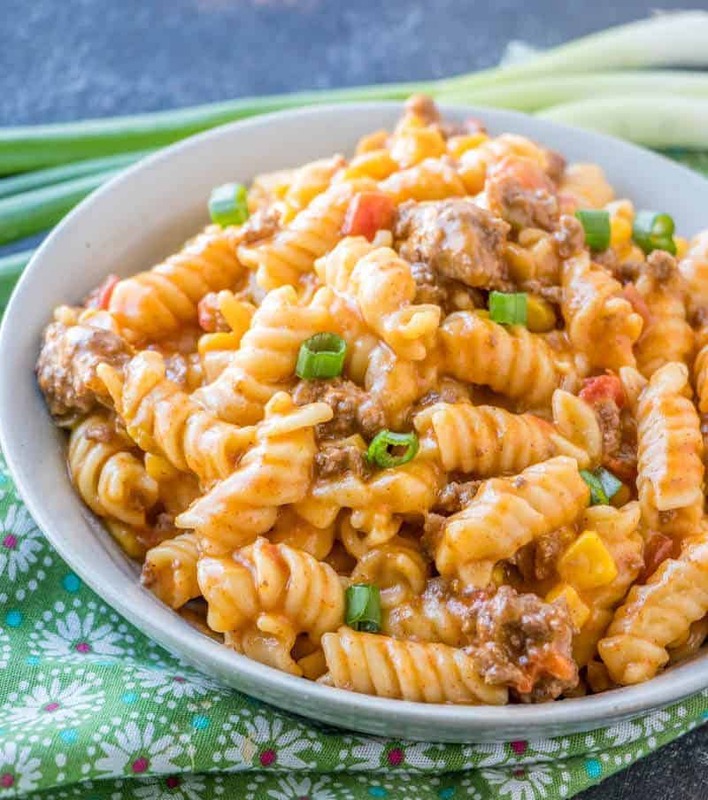 This Instant Pot Tago Pasta is really mild and great for little ones because it won’t be too spicy for them. You can add more spice as needed but this was the perfect amount of heat for my kids. This pasta recipe is so versatile, add in all the things that you want. I would add in black beans next time as I love them whereas my kids don’t and unfortunately I didn’t have any. Don’t like beef? Maybe switch it to shredded chicken instead. If you like a little more kick you can always swap out the diced tomatoes with some salsa. Mmmm. 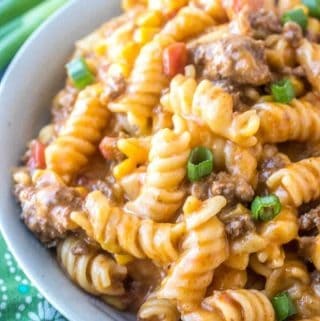 I love recipes like this Instant Pot Taco Pasta recipe because it really gives you the basis of a basic recipe that you can build off of and make it your own. Summer is fast approaching. Well technically we are in Minnesota and we just had a blizzard this last weekend so we might just buzz on over spring and go straight to summer the way it’s looking. But summer means sports and sports means a busy mama. So what does a busy mama like more than anything else? Low prep and quick meals. So in the summertime we rely on our instant pot to get dinner on the table in a short amount of time. 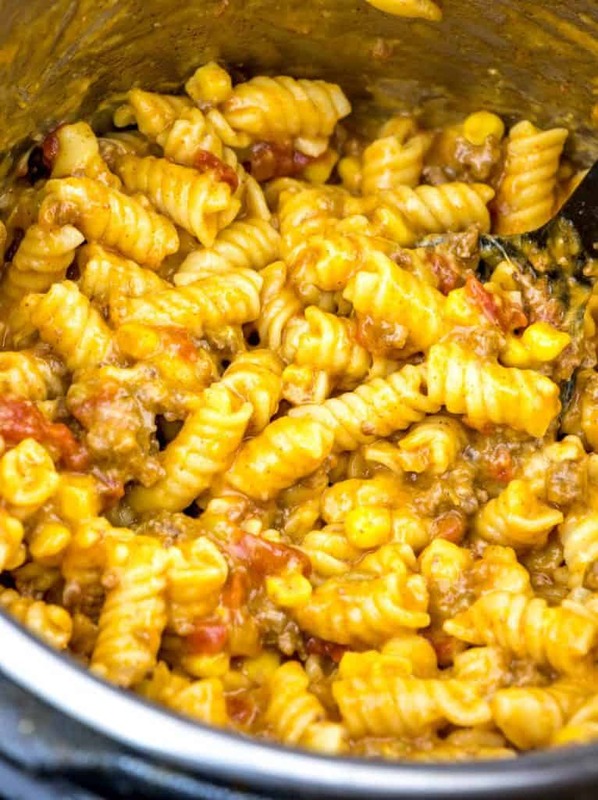 This Taco Pasta is just one of our many favorites. If you like this recipe you might also like this Instant Pot Garlic Brown Sugar Chicken, Instant Pot Chicken Caesar Sandwiches and this Instant Pot Red Beans and Rice. 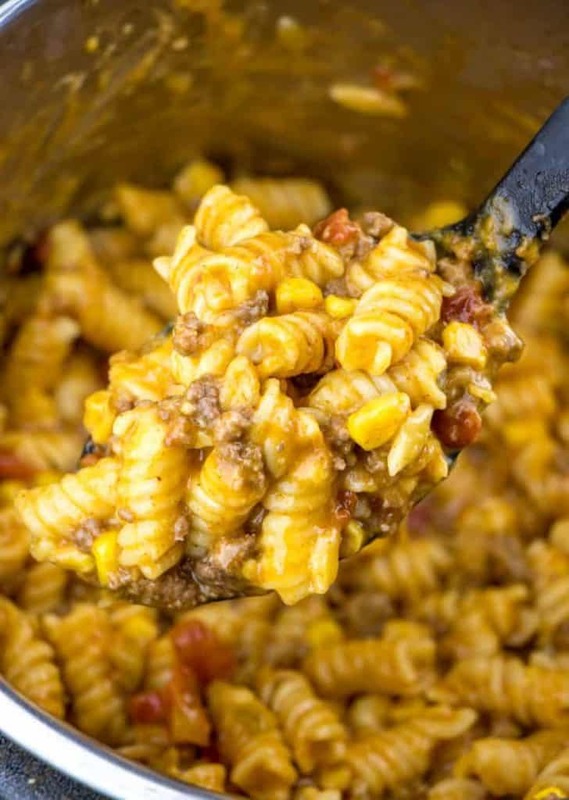 Creamy, meaty and hearty this Instsnt Pot Taco Pasta is full of corn, tomatoes, beef, green chiles and cheese. Making this recipe a quick and easy weeknight favorite. In instant pot set to saute mode and add in you onions and ground beef and brown until beef is no longer pick and onions are tender. Add in pasta, diced tomatoes, corn, green chiles, taco seasoning and water. Seal lid and cook on manual pressure for 5 minutes. Once done do a quick release of steam. Add in your cheese and salt and pepper and stir until melted. Loved this, was really delicious. We had the granddaughters overnight and it was so easy and fast and everyone had seconds After experimenting with the IP for a while now, I made a few changes. I used 2 pounds of hamburger, a bag of sweet frozen corn, a 28 ounce can of diced tomatoes, and 2 teaspoons of salt. The pasta cooked perfectly, it was nice and saucey, and perfectly seasoned. If you were to add black beans to the recipe, would they be canned, or dry? If dry, would you have to IP cook those first? I would used canned. Using dried beans in the IP Wild really change the recipe and measurements so canned would be the easiest. Made it exactly as written, and it was very good, but the pasta disn’t seem to absorb any of the flavor. I think next time I’ll replace some of the water with a can of rotel for just that little bit extra flavor. Very quick and easy, I’ll definitely make it again. Thank you! Is it really 3 – 31/2 cups of water? Or 3 1/2 cups of water? It’s 3 to 3 1/2 cups water, but you can use 3 1/2 to be safe. This was a big hit at our house. I used 3 1/2 cups of water which was too much for me, and made it soupy, but the cheese helped to pull it together. I will definitely make it again! Thanks for the recipe! Do you have to drain the meat? It’s more a matter of personal preference. You dont have to drain, but you certainly can.